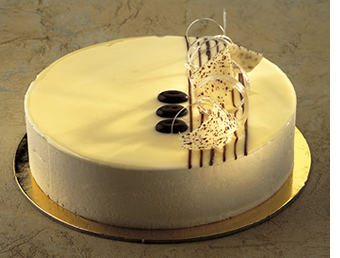 The cake is made by a base of savoys soaked in the coffee and by a bavarian cream with support of condensed milk. 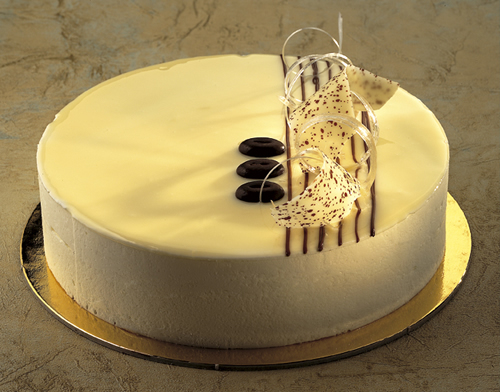 The cake is decorated with condensed milk neutral gelatine and chocolate coffee-beans and sugar threads. Combine coffee, sugar and glucose and bring the mixture at 60°C. Let cool (picture n. 1); pour it inside the acetate moulds (picture n. 2). Freeze and take off from the moulds (picture n. 3); place the semi-spheres inside a ring, previously prepared with savoys soaked in white coffee and a first filling of milk Bavarian cream (picture n. 4-5). Press, fill up and level with the remaining Bavarian and cool. Whip the yolks with sugar. Whip also the egg whites with the sugar and sift the flour with the starch. Mix the two dough and combine the flour with the starch. With a 8 cm of diameter pipe model some discs with a no-stop spiral. Cook at 220°C open valve; sprinkle the disc with the sugar and icing sugar. Boil milk with sugar and condensed milk, pour the mixture on the yolks, lightly whipped with starch and sugar, and warm until 82°C. Quickly cool and add the gelatine previously soaked and squeezed; when the temperature of 30°C is reached add the whipped cream. Go on with the assembly of the cake.